By using a Chinese feng shui compass practitioners can accurately determine the direction of their home, or space, and then create a detailed bagua map. The school of feng shui determines the type of compass the practitioner uses. 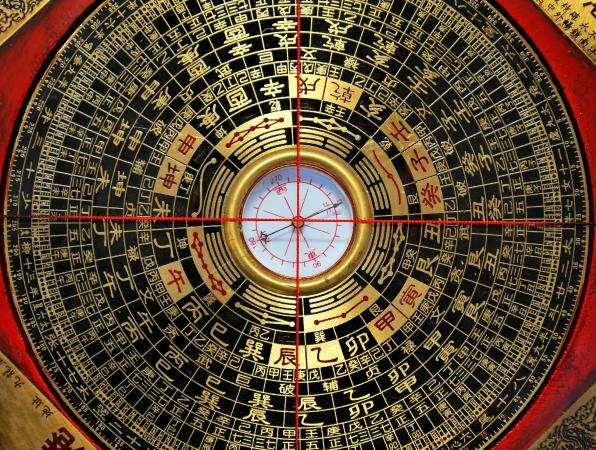 A complex tool used in feng shui, the traditional ancient Chinese compass is also known as a "Lo Pan" or "Luo Pan." Because of its intricate details and the complexities they involve, generally, only feng shui masters and advanced practitioners understand all the information provided by a luo pan. All the detailed information is necessary for a true and accurate feng shui reading. A Chinese compass is made of a center magnetic compass surrounded by a series of concentric rings and divisions set into the metal plate. The plate typically rests on a wooden base. Depending on the version of the lo pan, the metal plate, known as the heaven dial, will have from three to 40 or more rings. Each ring has a specific meaning and orientation purpose. Although there are many types of lo pans, several rings are basic and found on each compass. The wooden base of a luo pan, known as the earth plate, is square in shape so it can easily be aligned against structures and buildings. The earth plate is generally red in color to act as a strong protection keeping negative energy away from the luo pan. The color red in feng shui also symbolizes the element of fire and is a symbol of divine energy. The center magnetic compass symbolically represents the center of the universe and is known as the heaven pool or heaven pond. It is where chi begins, where yin and yang ebb and swell, flowing into each other and where rest and action interact in all aspects of the universe. Although there are a large number of different kinds of Chinese compasses, the three most common types are the zong he luo pan, the san he luo pan and the san yuan luo pan. Each of these has several common rings including the Early Heaven arrangements, the Later Heaven arrangements, and the 24 directions. A combination of the san yuan and san he luo pans, the zong he luo pan contains the ring of the 64 hexagrams of the I-Ching and the three distinct 24 direction rings. The zong he luo pan is the choice of feng shui practitioners that follow the principles of the Three Cycles System and the Three Combinations System. A new type of electronic feng shui compass was introduced in 2008 after a year of testing by feng shui masters. The masters found the new compass, called the Fortune Compass, accurate and gave it their endorsements. The electronic compass removes the chance of human error occurring while taking the compass readings. To have a completely accurate and true bagua map, it is essential to use a feng shui compass. However to find the "facing direction" of your home or space you can use a regular scouting or camping compass. Feng shui tips provides easy to understand instructions and tips for getting an accurate compass reading using a regular compass.